Lexi Michelle Blog: 5 ways to flirt with your husband! 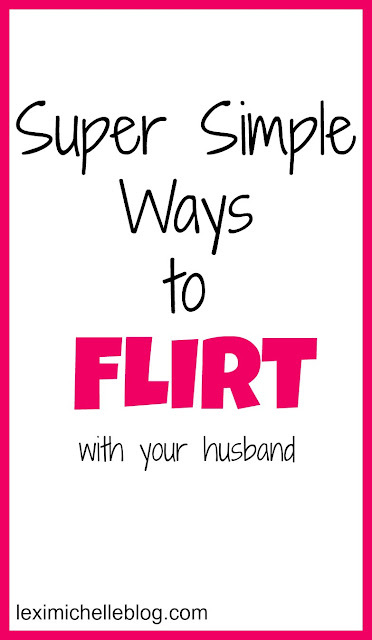 5 ways to flirt with your husband! Yesterday my husband and I were talking about when we first met. We were reminiscing about the good times and how things that made us nervous then are extremely easy now. For example, in the friendship stage for me I always debated "should I hug him goodbye? should I not?," "Scott's gonna be there, should I go? but I don't like watching the fights.. I don't want to seem like I'm just there to see him.. maybe I won't go.."
Everything was so new & slightly nerve racking, but also super exciting. I remember one time he ran into my apartment from the pool waking me up from my nap & he was shirtless. I couldn't help but stare. I was too sleepy to really keep my cool. The most attractive man on the planet ran into my bedroom, shirtless, to come to my rescue (he heard my apartment door was wide open & we had a creepy neighbor so he hurried to make sure I was safe). I remember all the sparks and electricity that would happen if our hands accidentally touched. I remember the anticipation that built up before that first kiss. I remember hanging on to every word he said & storing it away like it were some priceless treasure. Now I have him. He is mine forever. We are actually celebrating our anniversary in a couple days. Because I can kiss him/hug him/cuddle him anytime I want, I find myself taking a lot of it for granted. Sure there are times when I still catch myself staring at him like I did in the beginning (like in the morning when he's all dressed for work, just looking super cute). But I don't make any excuse to touch his arm or hand like I used to. I don't have every kiss memorized anymore. I want to reignite that fire that we had in the beginning. How do I plan on doing that? I'm going to flirt with my husband. I don't mean sending a sweet text or telling him how handsome he is. We really do that every day. I want to do those things you do in the beginning stages, when you're not trying to subtly let the other person know you like them because you're not quite sure how they feel about you.. Those subtle flirts are my favorite! 1. Eye contact- You know what I'm talking about. You look at him & look away when he makes eye contact. Then you look again, he makes eye contact, you smile like you've been caught, and then look away. Maybe since we're married, I'd follow it up by walking up to him with out saying a word & kissing him passionately for a minute then walking away. This really communicates just how attractive you still find him. 2. Playful touching- I used to do this all the time in the beginning. If I ever needed to get around him, I would make sure my hand grazed his back or his arm as I was walking past. Very casual physical contact. I call it the "excuse me hand graze." This works especially well if you can catch his gaze and slightly smile while you're doing it. 3. Voice- We all know the anticipation that starts to build when it's just you & him and you're having a conversation, but then your voice gradually gets a little quieter & the speed at which you're talking slows. That's when the good eye contact starts. You begin looking at his eyes, then his lips, then his eyes again. 4. No logical questions- We often get in the "how was your day" "it was fine" rut. Keep things interesting. Ask better questions. 5. No logical answers- Like the point before, if they ask you a boring/logical question try to answer in a more fun, illogical way. I know in the beginning, I never wanted to come off boring, so I always tried to answer logical questions in the most positive way, possibly with a little story of something interesting that happened. That positivity is truly contagious.